#TweetTheGeeks Is All About Black Friday! 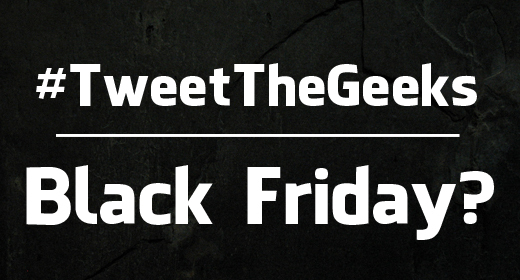 We want to know about your Black Friday plans for this week’s #TweetTheGeeks! Thank you all so much for your responses to last week’s #TweetTheGeeks; we answered them all in Episode 139! In preparation for Episode 140 this week, the Geeks want to know all about your Black Friday experiences. This week’s #TweetTheGeeks Question of the Week is this: Do you shop Black Friday? If so, what are you shopping for this year? Let us know your answers in the comments below! We will feature as many as we can in Episode 140, which will debut at 12:01 AM on Friday, so you can take us along on your Black Friday line-rides. Marty Cooper wants you to call 1 (707) OK-GEEKS! I certainly don’t plan on witnessing our society at its worst at any brick and mortar businesses. If anything I’ll do it from the comfort of my iPhone.